Waterbury "Crane" wall regulator. Totally original and untouched. Solid oak case with pressed designs in a darkened old finish. Both reverse decorated glasses are in excellent condition. The paper dial is signed and just about perfect. 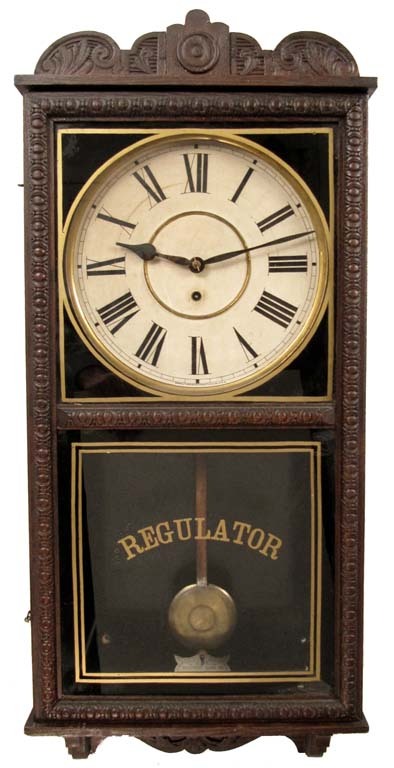 It has a good label, correct hands, signed beat scale and distinctive Waterbury pendulum. 8 day timepiece in good running order. 36" tall.